1. Dip the whole cheese in the egg and roll in the panko, then place in the fridge to set. 2. For the dressing whisk the gooseberry preserve with the olive oil, balsamic vinegar, lemon juice and a splash of boiling water, and season with cracked black pepper. 3. Heat the rapeseed oil in a pan and gently fry the cheese until golden on all sides – this will take around 4 minutes. 4. 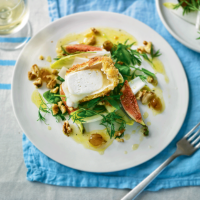 Toss the figs, chicory and salad into the dressing and toss gently to combine. Divide between 2 plates, cut the oozing cheese in half and place on top of the salad. Serve immediately with the nuts scattered over.